Q:Can I print a voucher? How do I save an electronic copy of a voucher? A: Yes. To print a voucher, go to the Basic Information page of the document you wish to print. You will see a list of reports on the far left-hand side of the page. Pick the form voucher you would like to print, e.g., Form CJA20. 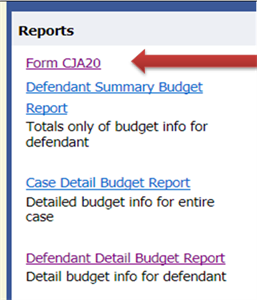 To print an authorization, choose the selection called Form Authorization, which appears farther down in the list of reports. In a moment or two, all the pages of the voucher or request will be combined into one document, which can be printed by clicking on the printer icon (or Ctrl+P). It will not, however, print any documents that have been uploaded to the document page. If you want to save an electronic copy of the file, follow the above steps, but simply select print to PDF, rather than to printer, and save it to your computer.